You are here:Home > Search for "pumpkin"
As seen in Country Living Magazine. Savor the comforting aroma sweet Autumn pumpkin topped with the perfect touch of cinnamon, vanilla, clove and sugar maple. Sugar, spice and everything nice. 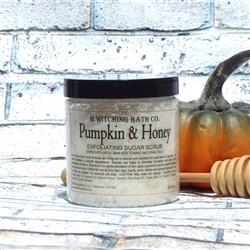 Our unique blend of naturally exfoliating sugar, rich emollient oils, Pumpkin Seed Oil, Vitamin E and our select pumpkin fragrance, banish away rough skin, leaving it silky smooth and lightly scented. This gentle formula may be used anytime, even after shaving. 8 fl. oz. Calling all pumpkin lovers. Enhance your environment with our signature Pumpkin & Honey fragrance, sweet Autumn pumpkin topped with the perfect touch of cinnamon, vanilla, clove and sugar maple. Illumination has never smelled so festive. Our candle collections are handcrafted with soy bean wax and zinc free cotton wick and tastefully packaged in a 9 oz. glass jar with a matching lid and a graphic designed kraft label. They burn for over 90 hours, melting evenly and radiating the festive fragrance to your environment. For the festive pumpkin lover. 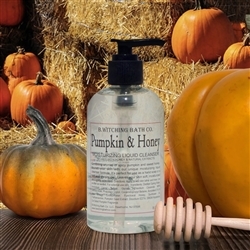 This lotion formula embraces the comforting aroma of sweet Autumn pumpkin topped with the perfect touch of cinnamon, vanilla, clove and sugar maple. Our signature smooth lotion formula moisturizes skin with emollient oils, aloe vera and Vitamin E. It gets to work right away, leaving skin noticeably softer with a smooth powdery after touch, never a greasy residue. Our delightful signature fragrance will linger on skin for hours. 8 fl. oz. This signature collection embraces the comforting aroma of sweet Autumn pumpkin topped with the perfect touch of cinnamon, vanilla, clove and sugar maple, a favorite among our fans. 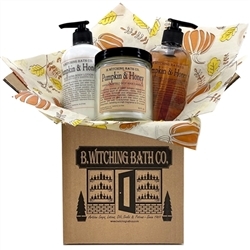 Gift Set includes one full size each: Hand and Body Lotion, Liquid Cleanser and natural sea sponge, packaged in clear gift bag with orange bow. A festive addition to your holiday powder room or kitchen. Makes a Great Hostess Gift too! This perfect fall fragrance embraces the comforting aroma sweet Autumn pumpkin topped with the perfect touch of cinnamon, vanilla, clove and sugar maple. This box includes one 9 oz. candle, one 8 fl. oz hand and body lotion and one 8 fl. oz. liquid pump soap.